We all know the routine... round up the kids, ask them to stand still and smile as you try to take a picture with your smartphone, only to have the picture ruined by the slightest bit of motion or bad lighting. This isn’t the picture you want to post on your social media page for all the world to see. It’s also not the kind of photo you will cherish for many years. Now imagine taking that same photo with the D3400 Triple Lens Parent's Kit. With three powerful lenses included, you can cover all the angles and create heirloom photos that your whole family will enjoy. Fast, responsive, simple to use and great in low-light, the D3400 delivers beautiful photos with far less effort. Why should you use a DSLR camera? Because your family's memories deserve to be preserved in the best quality possible. With D3400’s great autofocus system and fast burst shooting, you can take photos and video of the kids just being kids; running, jumping, riding their bike, etc. Take pictures of infants in extremely low light without a problem. Freeze fast-action in its tracks. Create portraits with rich, natural skin tones and beautifully blurred backgrounds. The photos you share will amaze everyone—even yourself. Better photos, transferred automatically to your compatible smart device. With the built-in Bluetooth connectivity options of the Nikon D3400, you can easily capture beautiful photos and share them with the whole family via the Nikon SnapBridge app. The SnapBridge app works seamlessly with NIKON IMAGE SPACE, a cloud storage and sharing site, to back-up your photos and help you create and share albums with your friends and family. The future of connectivity and sharing is here, and your D3400 is ready to help you share your great photos with the world. The D3400 makes photography easy and fun, freeing you to focus on your kid's natural talents—framing great shots, anticipating special moments and finding unique perspectives in everyday scenes. As your abilities grow (and they will grow) you can take complete creative control of the D3400. Does the device you use to capture video allow you to zoom in close for a tight shot of your son during his baseball game or do you have to record the entire field and the backs of other peoples’ heads in the stands? And does it do a good job recording your daughter’s dance recital from your seat in a dimly lit theater? The D3400 records superior quality 1080/60p Full HD video with the flexibility you need to capture those special moments beautifully. The D3400’s flexibility will empower you to create spectacular videos of your loved ones that you will cherish for years to come. Press and hold the D3400's shutter button and capture at a speed of 5 frames per second (fps) continuously with full autofocus performance—this means you can freeze the action while knowing your images will remain tack sharp. Transform a moment of fast action into a thrilling photo sequence, then share it through SnapBridge for all to see on your favorite social media sites. Your family is dynamic, shouldn’t your photos be? With three great NIKKOR lenses you have enough versatility and choice to capture all of the great moments as they unfold. 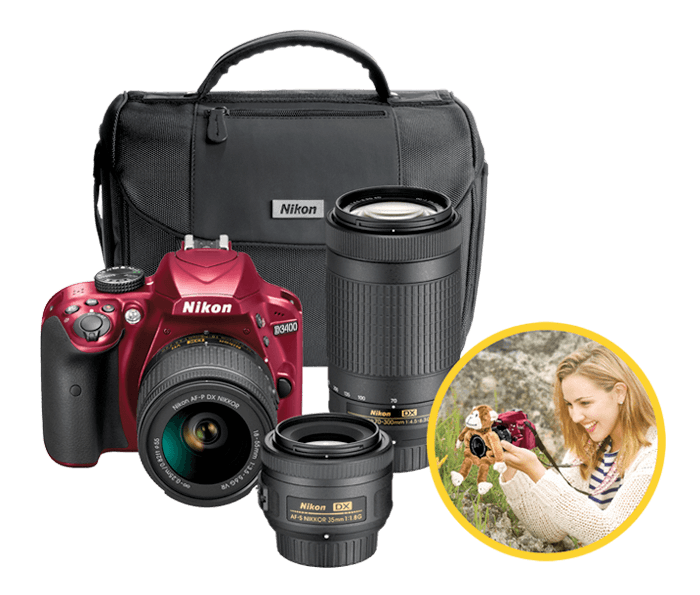 This kit includes the AF-P DX NIKKOR 18-55mm f/3.5-5.6G VR lens for everyday shooting, the AF-P DX NIKKOR 70-300mm f/4.5-6.3G ED super-zoom for getting in closer to your subjects and the ultra-sharp AF-S DX NIKKOR 35mm f/1.8G prime that you’ll love to use when capturing gorgeous portraits of your kids. NIKKOR lenses have long been the benchmark of optical excellence, and every lens offers an inspiring new view of your world—see for yourself how NIKKOR lenses can help you better capture your world. No more chasing toddlers, making silly animal noises, or bribing your kids in an attempt to get them to look at your camera and smile. Get natural smiles from your loved ones with this adorable Shutter Huggers™ monkey around your lens*. Works great for getting your pet’s attention, too! *Note: the camera's built-in flash cannot be used when the Shutter Huggers™ Monkey is attached to the lens. Get started on that brag book! 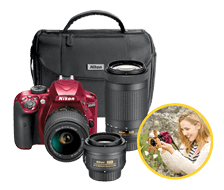 As an exclusive offer, Nikon has teamed up with premium quality photo lab MPIX (www.mpix.com) to offer purchasers of the D3400 Triple Lens Parent’s Camera Kit, a $30 discount voucher for the purchase of a photo album of $50 value or more. Learn the secrets to taking portraits that will be cherished for a lifetime from renowned lifestyle photographer and Nikon Ambassador, Tamara Lackey. Included in the D3400 Triple Lens Parent's Kit is access to the "Photographing Children & Pets" online video class**—in this class you’ll learn how to get genuine expressions from children and pets, how to create poses that look and feel natural, how to softly blur the backgrounds, which lenses are best and more.